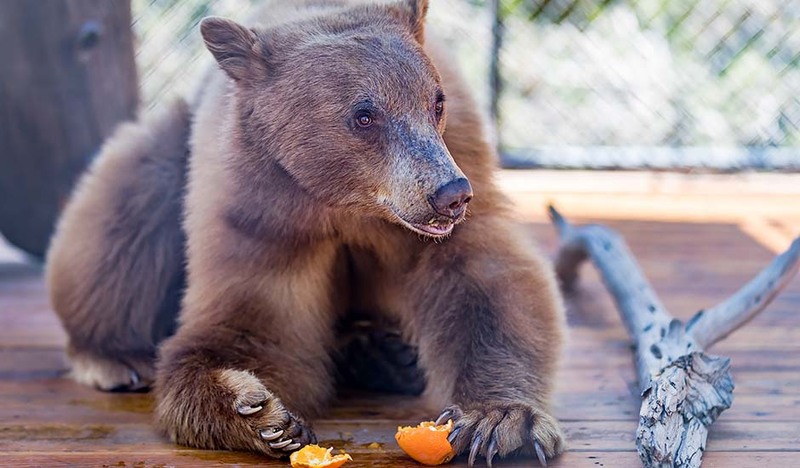 On July 20, 2015 this orphaned bear was delivered to Animal Ark by the Nevada Department of Wildlife. As with all wild bear cubs that arrive here he was intended for release back into his natural habitat. We learned upon his arrival and more so later from a park visitor that he was staying near some vacation cabins and was being hand fed. The animal keepers soon noticed his lack of fear when in proximity to humans. He was particular about foods and seemed to have a weak immune system. Unusual for our rehabilitation bears here at Animal Ark, this cub would not hibernate in the hay filled den we provided so we had to feed him through winter. He could not overcome his early interactions with people. We do not know what he was fed or the type of human garbage he may have gotten into nor what happened to his mother. Did she die in the wild or did she abandon her cub for some reason? With so many factors in mind it was decided this young bear was not a suitable release candidate and that his success for survival in the wild was slim. He then became a permanent resident of the Ark and was given the name Gibbs. In the late fall of 2016 Gibbs was moved to this redesigned enclosure. He is a sensitive bear so everyday his keepers provide an interactive foraging routine along with a clicker training session. He likes people and his keepers are very fond of him.